Is there really no such thing as bad publicity? 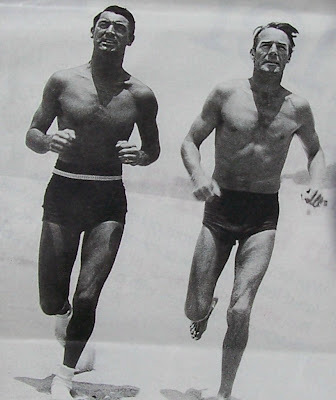 In the 1930s Cary Grant and Randolph Scott posed for a series of photos that highlighted their domestic lives together as room mates. In one picture Grant is wearing an apron in another they sit close together on a diving board. In the most suggestive of the photos, they are shown in silhouette with the ocean in the background. 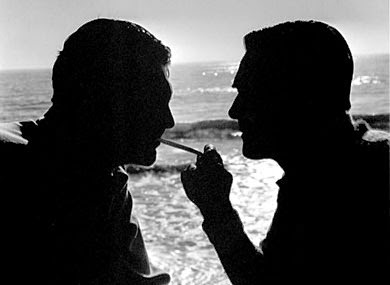 Scott reaches over to light his cigarette from Grant's. I'm sure that the intention of the publicity campaign was to show how Hollywood stars are just regular people who do normal every day things and to show the camaraderie between their contract players. Over the years the photos have popped up repeatedly usually as evidence of a gay relationship between Grant and Scott. I'm not sure whether the photos actually started the rumors that Grant and Scott were lovers but it's safe to say that they've done nothing to quash them. A book came out last year that maintained that the studio publicity machine actually deliberately created that subtext in order to give the actors a gloss of free-living bohemianism. My reason for posting this is not to drag up the controversy again since I feel like it's been done to death. I just happened upon this picture and it reminded me that many of the pictures in this infamous photo shoot are among my favorites of Grant. Many of the pictures have an absurd quality such as the one where they are tossing a giant medicine ball around and those who can tear their eyes away from the beefacke long enough will note that Grant is wearing white bobby socks on the beach. I put one of the photos in my book, not only because I felt like it needed to be addressed in as honest a manner as I could, but because I couldn't imagine a compendium of pictures of Grant's life that didn't include some of those photos. They are part of his image, good, bad or indifferent. Grant spent a fare amount of time in the last twenty years of his life denying as politely as possible, rumors that he was gay or bisexual and Scott's family have come forward also to deny them as recently as last year. Books on Hollywood continue to state Grant's bisexuality with point-blank authority when his more thorough biographers are convinced that at most it is still an open question but more likely to be a case of guilt by association. The fact that these pictures were printed as recently as last year in a major English newspaper makes me think that that more than twenty years of after his death, Grant is still making news, and that there really is no such thing as bad publicity. I am all about equal opportunity eye candy. HOWEVER. Those socks are truly disturbing. What the freakin rock were you thinkin, CG? Now I'm trying to remember if I've ever seen photographic evidence of Cary Grant's feet. Is he possibly hiding some grand deformity? Bunions? Toe jam? Dear God please not fungus. O Jenny All-Knowing, please help! I really think the socks were utilitarian. I don't think Cary liked the hot sand on his feet and the socks protected them. I know it may sound lame, but sometimes the simplest answers are the right ones. So why hasn't anyone made the same argument about Gene Hackman and Dustin Hoffman, as they roomed together? I'm guessing that there's no similar photos, being that both are as striaght as can be. Which came first, these photos, or the ones of J. Edgar Hoover and his "roommate"? I have always wondered why they agreed to this photo shoot and why the studio allowed it. Were they naive about the speculation it would invite, or as you say, did they think that any publicity would be a good thing at this early point in their careers? I would think this could have damaged their careers, but fortunately for us, it didn't. Then again, perhaps 70 years later we're looking at it differently than their contemporaries who read the article when it was first published. I've always loved these pictures too, because 1)Cary looks amazing, and 2)they are ridiculous. The socks on the beach have always cracked me up. Anne-"To Catch A Thief" is a perfect way to see his feet when he is at the beach at Cannes. Of course it's not a close-up, but hey they look just fine to me! LOL! Perhaps he had truly repulsive feet...? I don't recall the title, but there is a hollywood expose that deals with the topic of Grant's sexuality, his 12-year affair with Scott, and a decades-long relationship with the somewhat notorious Howard Hughes. تعتبر مؤسسة الأمجاد من أفضل شركات النظافة العامة بالدمام والأحساء في مجال التنظيف فنحن ننظف الفلل والمنازل والشقق والشركات والمحلات بدقة وجوده عالية جدا , لدينا عمالة ماهرة مدربين وذو كفاءة وخبرة عالية , كما أننا ننظف أيضا المجالس والموكيت وواجهات المنازل ونقوم بغسيل جميع أنواع الموكيت والستائر والسجاد وإزالة أصعب البقع الموجوده عليها بسهولة تامة لأننا نستخدم معدات وأدوات حديثة جدا ليس لها أي ضرر على الإنسان .